It feels like we've been in Summer for at least a month, but the Solstice only just passed and we're ready to get out there and grill some delicious burgers! If there's one item we had to pick as consistently hitting the top of the sales chart, it would totally be Michael's English Muffins! Often compared to a donut, these deliciously fluffy English Muffins make the perfect burger bun. Here's a recipe for an English Muffin burger that will have your guests coming back to the grill all summer! Patty up the ground beef into your desired shape or size, and be sure to roll in some Non's Pinching Salts or Yah's Best Herbal Delight. If you're feeling spicy, you can always mix in some Firsthand Foods Ground Chorizo for some complexity and a kick! Grill your patties to the desired temperature. We're all about a medium rare burger here at RP! Throw those English Muffins on the grill to toast them up and you've got the makings of a great burger on your hands! Time to fry those eggs! I'm all about a hard fried egg, but our owner Kim likes them runny, so it's safe to say that personal preference is key when it comes to your guests. Give each burger a generous spoon of pimento cheese and top with the fried egg and a sprinkle of microgreens. Your burgers are complete! Keep it classic with Imladris Farms' Smoked Ketchup with Ashe County Sharp Cheddar for a modern flavor that will take you way back. This is the flavor that came right before cake and ice cream during birthday parties at literally everyone's house growing up, and those are pretty fond memories of mine. This is definitely a go-to! Devour multiples with a Deep River Brewing Limetown Lager. Because we're adults now. There's simply not enough time in the day to tell you how much I love Lusty Monk's Honey Mustard. So I'm going to stop and tell you that you should also try their Original Sin and Burn in Hell Chipotle variants! Not only are they hilarious conversation pieces for the next person to open your fridge, but they also pair extremely well with the sophisticated creaminess-meets-sharpness of Ashe County's Monterey Jack. Enjoy this combo with a cold Fullsteam Fearrington Summer (India Tea Ale). Carolina Gourmet's Regular or Spicy Cucumber Sauce also makes a fresh and unique burger with Ashe County's Monterey Jack Cheese. I prefer the spicy for the added dimension, but there's definitely something about the deliciously cooling qualities of cucumber and dill, especially when they meet that creamy, sharp cheese that has us always coming back! Eat this burger with Brueprint's Fig & Honey Saison to drink. For the adventurous among us, I cannot stop eating the savory-sweet, tangy and textured combo of Goat Lady Dairy's Smoked Goat Cheese and Copper Pot Traditions' Oven Roasted Tomato Jam. Especially on a burger for the added fat, this combination takes your palate in a different direction that never disappoints! You're going to want Burial Brewing's Keeper's Veil Honey Saison in between bites! Have any ideas for burger toppings that we missed? Share them with us in the comments below! We're always eager to eat different English Muffin Burgers! Every time I walk to Bittersweet to break down a new wheel of Chapel Hill Creamery's Hickory Grove, the joke is made that I've just come to cut the cheese and leave! In the most literal terms, this is my Wednesday MO, and because September is NC Wine Month, that ever-occurring joke put my mind on the best cheese plates I've ever had and their pairing possibilities. The best thing about a cheese plate is that it can be any size you want. Are you hanging at home and need a decadent lunch to pick at between Netflix and laundry? Are you gathering a group of friends to catch up and drink wine? No matter the occasion, cheese is definitely the answer! Here's how to answer with class. 1. The more texture involved, the better. Typically when a bar or restaurant offers a cheese plate, you will find a progression from soft to hard cheeses. This can range from double cream to hard cheese and hit every texture in between. 2. So many animals produce milk used in cheesemaking. You can definitely make a plate of only cow or only goat cheeses, but why not mix it up? Different animals graze on different vegetation in different parts of the world, and at different times of year. This creates a wide range of flavor in the milk they produce. Try adding goat, sheep, buffalo, and cow cheeses in any combination to your cheese plate to not only increase the variety of textures and appearances, but also flavor. 3. Inclusion cheeses and rinds can really make a difference. While there are many textures, styles, and types of cheese available to use in your go-to cheese plate, offering inclusion cheeses brings a load of fun to your plate! Goat Lady Dairy has a variety of cheeses that include outside flavors like Fig & Honey and Bell Pepper & Garlic. It's also important from the perspective functionality to leave parts of the rind on each kind of cheese you offer. Whether bloomy, washed, soaked, or wrapped, leaving a small amount of rind with parts of each cheese ensures that you won't get them confused (totally happens) and has the added benefit of being a handle of sorts for any dipping action. Using side items or accompaniments to complement and bind the flavors of your plate is only as challenging as you let it be. If you're a perfectionist like me, having a copy of "The Flavor Bible" on hand to match flavors is a great way to go, but really all you need is your sense of style! Here are a few options to round out your plate. A well-chosen jam can act as a perfect flavor binder between two cheeses on your plate that you may feel are just too different to play together. Right off the top, pairing a sweet and spicy jam like Pick and Preserve's Strawberry Cracked Pepper Jam (pictured) with Goat Lady Dairy's Classic Chèvre gives that amazing balance of tangy and sweet with an added peppery finish! Lightly drizzled on a creamy cheese like Chapel Hill Creamery's Carolina Moon, honey can go a long way in supplementing the natural sweetness and floral flavors that may be present in many cheeses. Or consider a whipped honey like Cloister's Ghost Pepper to add a creamy texture and spice to a cracker or piece of bread. We really love a drizzle of our most local honey from downtown Raleigh beekeeper Mr. Buzz! Using a small handful of one or two kinds of nuts are sure to hit a common flavor note with some of your cheeses. Almonds, pistachios, pecans, cashews--any kind of nut will play nice with cheese. 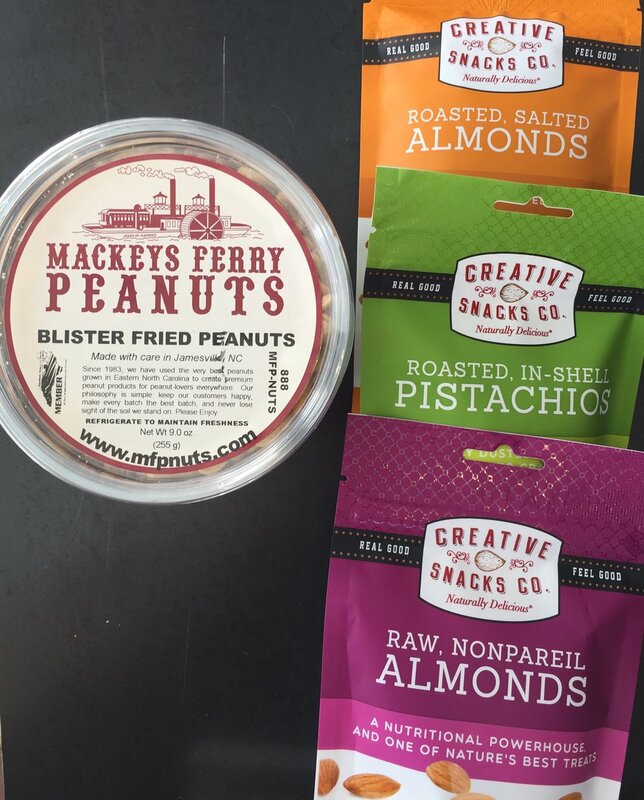 We recommend Creative Snacks Company's small bags for their scale and quality or Mackey's Ferry Peanuts' Blister Fried for a larger group. If you're feeling fancy, you can always throw them in a pan over medium-low heat to toast them to really release the flavor! While this may seem weird to some, chocolate and cheeses can be a match made in heaven when done well. 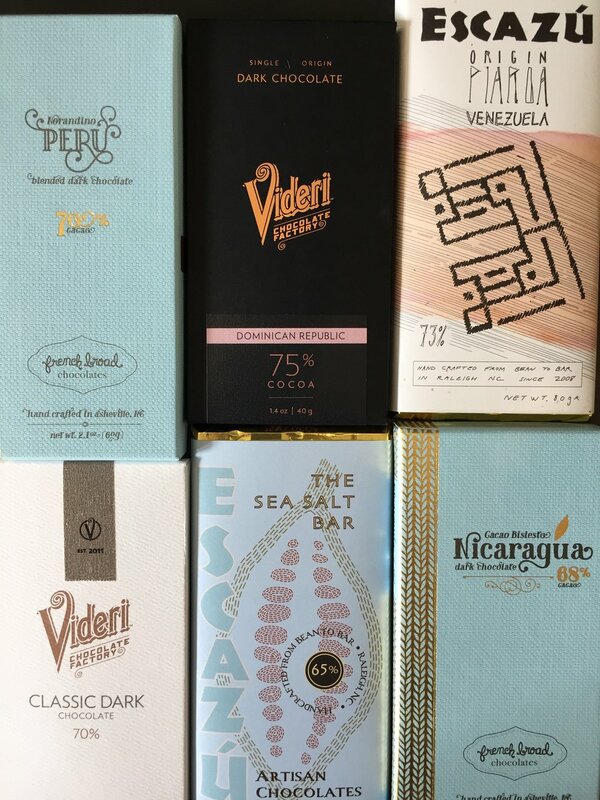 While chocolate tasting and purchasing for your palate is a labyrinth of information in itself, keeping it simple when pairing with cheeses and always understanding the balance between sweet and savory and flavor profiles will be very rewarding. We recommend trying French Broad's Malted Milk Bar with Chapel Hill Creamery's Carolina Moon: the buttery notes resonate well and the chocolate provides the perfect amount of malt on the finish. You can also make the pairing super special with Avenue des Chocolats' beautiful bonbons! Placing cured meats on your cheese plate can provide quite a different experience in texture and boldness. However, if you pick something super fatty or spicy it can quickly overwhelm less bold cheeses. We love San Giuseppe's Sweet or Hot Soppressata and Milano Salami, just steer away from pairing them with any cheese that's on the salty side (like parmesan) or of the melting variety like cheddar or campo. All things brined and pickled! In the South, there aren't many things that have escaped the pickling process--and for good reason! Serving a purpose in both a pairing and palate-cleansing sense, pickles, olives, and even pickled okra can totally elevate your cheese plate in a stylish and sometimes wacky way. Go for the Kyōōkz pickles out of Greensboro, you won't be disappointed! Every cheese plate needs a little bread or crackers. And while there are a variety of options and sizes, I recommend a simple baguette or a sourdough loaf if you don't want too much interfering flavor, but you can definitely branch out with a 9-Grain for some interesting combinations. Same goes with crackers--simple flatbreads are a great way to add crunch without changing the flavor of the cheeses. We get our bread fresh from The Night Kitchen and have Roots & Branches crackers and The Accidental Baker flatbreads on deck for your needs! When it's time to take a break from the cheese and accompaniment pairings on the plate, or if there's that one friend who just doesn't like anything, a nice olive oil on the side is a super way to say you understand. The Flying Olive Farms brand imports amazing Greek olive oils that are sure to inspire your tastebuds! Just pour it in a small bowl with a drizzle of balsamic vinegar and a dash of local sea salt from Sea Love Sea Salt Co out of Wilmington. * Don't let this long list overwhelm you! Two or three of these accompaniments will go a long way in making your plate memorable. This wine from Sanctuary Vineyards is a blend of Cabernet Sauvignon, Merlot, Malbec, Cabernet Franc and Petit Verdot with oak and spice notes. Pairs well with sharper cheeses like parmesans. From McRitchie Winery & Ciderworks, this is a Traminette / Riesling blend with notes of honey, tropical fruit, and rose hints. Its natural sweetness pairs well with robust cheeses with a funky flavor like Boxcarr's Rocket's Robiola. This Biltmore Estate wine is medium bodied with blackberry aromas and earthy notes finishing with vanilla and soft tannins on the finish. Pairs well with subtly flavored cheeses like Chapel Hill Creamery's Carolina Moon, a Camembert. A Spanish varietal of grape, the Sanctuary Vineyards Pearl Albariño is not commonly seen growing in this part of the world. Minerally and full of tropical fruit flavors, this staff favorite pairs well with a simple, tangy goat cheese like the Goat Lady Dairy Classic. A refreshingly light dunkel lager, the Mother Earth Brewing Dark Cloud goes down easy and finishes with a delightful malt characteristic that pairs extremely well with goat cheeses and most rind-less cheeses including Ashe County's Monterey Jack. This crowd favorite from Gizmo Brew Works is brewed with honey on a base of wheat and drinks easy in the warmer seasons. Its pairing friends are chèvres like the Goat Lady Dairy Classic or one of their fun inclusions. This Wicked Weed beer brewed with orange, honeysuckle, and brettanomyces can be fun to match with a plate of cheeses that accentuate its flavors. Try with a range of washed-rind cheeses like Chapel Hill Creamery's Hickory Grove! This Fullsteam beer is an IPA is brewed with rye and apple pomace, a star of the fall season that pairs extremely well with Chapel Hill Creamery's Carolina Moon, a Camembert, drizzled with a little honey. When choosing an appropriate wine to complement your cheese plate there's a quick, simple rule: the more bold in flavor your cheeses are, the less complex the wine you should choose -- and vice versa. So if you love to fill your cheese plate with blue cheese or spicy monterey jack, a simple red table wine or the Jones von Drehle Chardonnay would be best. Or if you prefer a simpler selection of cheese, amp up the plate with jams, pickled things and a complex wine like the Sanctuary Vineyards Pearl Albariño. When it comes to beer, matching strength with strength is typically the way to go. Strong blues and a multi-dimensional IPA like Bond Brothers' Duality of Funk, or fresh, mild chèvres and Belgian styles like Nickelpoint Brewing Co's Golden represent the kind of matches that make a difference in pairing. These rules are hardly hard and fast, but they should generally get you a sublime pairing! Cycle through the pictures in the gallery and hover over them to see the name, description, and suggested pairing with each wine and beer! It's always best to cut your cheese (!) just before it's served, leaving at minimum an hour between cut and consumption. Let any jams, preserves, pickled items, or cured meats come to room temperature, let your wine of choice breathe a little, and cut your bread just before serving and after adding your selected accompaniments. Now pour yourself a glass or four and enjoy!!! If you're really into this whole cheese thing, I recommend doing some homework with Judy Ridgway's "The Cheese Companion" for light reading and using Max McCalman & David Gibbons' "Cheese: A Connoisseur's Guide to the World's Best" for a much more advanced look into various styles and pairings. Do you need any of these items en masse for a holiday spread or office party? Check out our Custom Services page for more information.